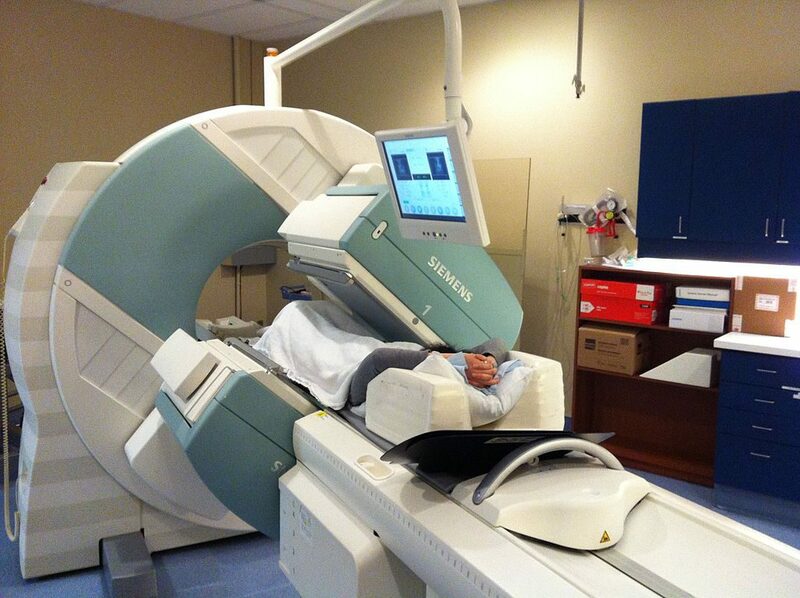 Single-photon emission computed tomography (SPECT) uses short-lived radioactive substances to measure the blood flow in the brain. During the procedure, a tracer is injected into the child and becomes trapped in position inside the body. The tracer’s immobility means that the patient can move during the multiple-hour procedure without disrupting the image capture process. Areas of the brain with heavier blood flow, such as regions that give rise to a seizures, show up more brightly on the SPECT scan. These scans can be performed during a seizure (known as the ictal period) to characterize the source and path of the seizure, or between seizures (the interictal period) to identify the origin of frequent seizures. Of course, identifying the source of the seizure is most effective if SPECT is performed while the seizure is happening or immediately afterward, rather than during the interictal period. Though SPECT can be extremely helpful—surgical removal of areas with increased blood flow during seizures can reduce seizure frequency, and SPECT scans can shed light on the behavioral and cognitive effects of epilepsy—it is not commonly used to diagnose or understand epilepsy in children. The tracer is injected at the start of a seizure, and because many children have short seizures, the tracer may not make it to the brain in time to obtain a useable image. Furthermore, the spatial resolution of SPECT is half that of PET, making it difficult to examine the brains of children. For these reasons, SPECT is more often reserved for use when MRI scans or EEGs are inconclusive. This approach has been useful in discovering the source of seizures in infants with focal cortical dysplasia. Kudr M, Krsek P, Maton B, Malone S, Jahodova A, Komarek V, Jayakar P and Duchowny M. 2016. Ictal SPECT is useful in localizing the epileptogenic zone in infants with cortical dysplasia. Epileptic Disord. 18(4):384-390. Kumar A and Chugani HT. 2017. The Role of Radionuclide Imaging in Epilepsy, Part 1: Sporadic Temporal and Extratemporal Lobe Epilepsy. 45(1):14-21. Rakvongthai Y, Fahey F, Borvorntanajanya K, Tepmongkol S, Vutrapongwatana U, Zukotynski K, El Fakhri G and Ouyang J. 2017. Joint reconstruction of Ictal/inter-ictal SPECT data for improved epileptic foci localization. Med Phys. 44(4):1437-1444. Stamoulis C, Verma N, Kaulas H, Halford JJ, Duffy FH, Pearl PL and Treves ST. 2017. The promise of subtraction ictal SPECT co-registered to MRI for improved seizure localization in pediatric epilepsies: Affecting factors and relationship to the surgical outcome. Epilepsy Res. 129:59-66.